This is the web page for the Irish National RDA Node. We are delighted that the National Library of Ireland is the Irish National RDA Node, which means that the National Library of Ireland is responsible for the support and promotion of RDA activities in Ireland. Please visit www.nli.ie to learn more about the National Library of Ireland. We work very closely with the Digital Repository of Ireland (www.dri.ie ) who are a partner in the current RDA EU grant, and a leader in the area of Research Data Management particularly in the Humanities and Social Sciences. We co-organised the third RDA Plenary meeting in Dublin in 2014, and continue to promote RDA in Ireland and also abroad. This working area connects researchers working with research data in Ireland, and enables them to interconnect with broader RDA activities through e.g. RDA Working and Interest Groups. We are happy to engage with researchers, research communities and private sector actors, regarding getting involved in RDA, and testing and adopting RDA outputs and recommendations. We have a particular focus on library, archives and digital humanities activities. Feel free to register by clicking on the 'Join' link on the right and share your own updates via posts to the mailing list or group calendar. DRI is co-hosting the next edition of the International Digital curation Conference in Dublin from the 17 to 20 February 2020. The Call for Papers is now open. Please find all the details below. We hope you will join us! P13 starts at 9:00 EDT (14:00 GMT, 15:00 CET) tomorrow, 2 April 2019. We wanted to highlight this upcoming webinar focused on RDA Outputs for Reproducible Health Research. We hope it is of interest. We wanted to share with you a few updates hopefully of interest to you. RDA Europe webinar on the Early Career and Expert grants – Presentation and Recording now online! Thank you very much to those of you who have joined our Meet the Expert session last Monday. 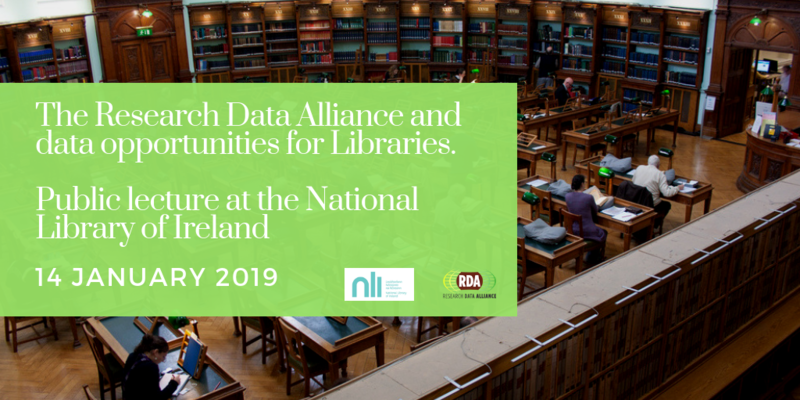 Hosted by the RDA Ireland coordinator, the National Library of Ireland, the lecture provided by Hilary Hanahoe, RDA Secretary General, covered the opportunities brought forward by the emergence of data intensive science and data management mandates extended to traditional libraries. The talk has highlighted how the Research Data Alliance supports the work of the libraries, librarians, archivists and information professionals in this evolving context. You are invited to attend the public lecture provided by Hilary Hanahoe, Research Data Alliance Secretary General, covering the opportunities brought forward by the emergence of data intensive science and data management mandates extended to traditional libraries. The talk will also highlight how the Research Data Alliance supports the work of the libraries, librarians, archivists and information professionals in this evolving context. The National Library of Ireland organises a series of 8 “Meet the Experts” talks inviting national and international speakers to present topics of relevance and interest to different stakeholders and audiences. The first one will be a public lecture: “RDA Ireland “Meet the Experts” by Hilary Hanahoe - Research Data Alliance Secretary General.